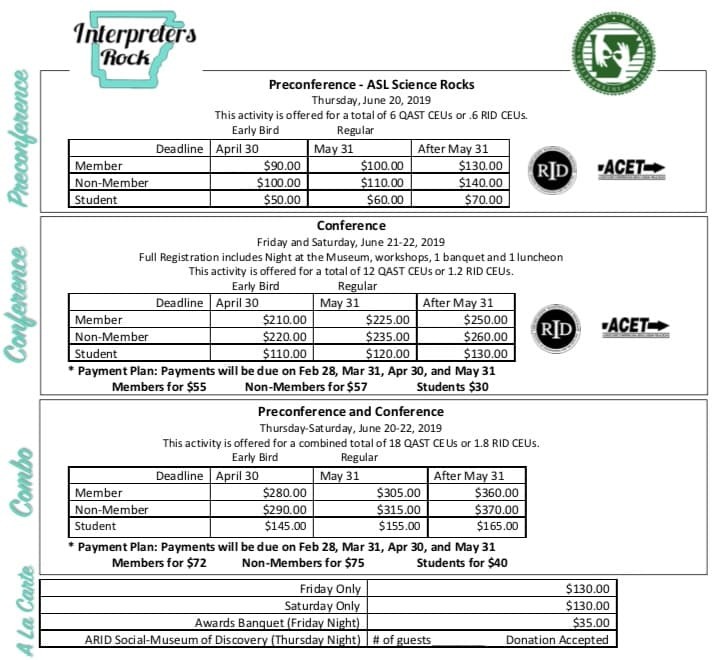 Please look at the printable registration form for prices and conference schedule. Please indicate alternate types of communication access you require 2 weeks in advance of the conference. All participants will receive Certificates of Attendance to the email address provided. Certificates will be emailed within 45 days from the conclusion of the conference. If you have reporting needs other than RID or ARS, you are responsible for reporting CEUs. ARID reports CEUs to ARS and RID but ultimately the responsibility of CEU reporting falls on the credentialed interpreter. If you have any questions regarding the process of obtaining or reporting CEUs, please contact the ARID Professional Development Committee at: aridpdc@gmail.com.